Takah Sushi closed in April after 34 years in Aspen. The 3,400-square-foot space is now available for rent and a local group emerged this week with preliminary plans to open a Japanese restaurant in the space. 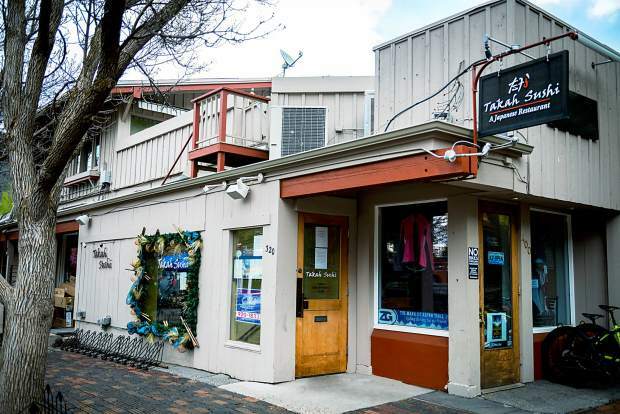 A local group is looking to open a Japanese restaurant in the former Takah Sushi space on Mill Street, according to those involved in a potential deal that includes negotiations for Takah equipment. “I really want to know that it’s signed, sealed and delivered before I say anything about it altogether,” Coffman said. Hale and his partner Jonathan Sundeen are both from the area, while the third partner, Peter Coyne, has spent more than 20 years here. Sundeen has worked for the Thomas Keller Restaurant Group the past eight years, while Coyne has worked in various high-end restaurants across the country. Hale will run the back of the restaurant with Coyne, who Hale described as having a professional take on modern Japanese cooking. The new concept will not carry the Takah name, as Hale said Coffman wants to retire the restaurant as her legacy. Hale said the group plans to change very little about the flow of the restaurant but patrons can expect an original menu. “We’ve been waiting our whole lives for this opportunity, and we’re going to go all in when it comes to the food,” Hale said. Established in 1981, Takah Sushi served as one of Aspen’s longest-running restaurants, occupying the basement space currently home to Zocalito before moving to Mill Street in the mid-2000s. An expiring lease, increased rental rates and the lack of a successor to the retiring Coffman all played into her decision to close this past spring. The business was originally put up for sale in 2014 before Coffman decided to remain open one more year under the management of her daughter Sasha Sells. Coffman’s lease is set to expire June 15.